Violent clashes continued in Bangladesh as authorities fired tear gas and shut down mobile internet connections after a week of student protests that brought tens of thousands to the streets. By 1pm (07:00 GMT) on Sunday, thousands of students from various schools and colleges started controlling traffic in the capital, Dhaka, for the eighth consecutive day. Bangladeshi police fired tear gas at students occupying an intersection in central Dhaka. 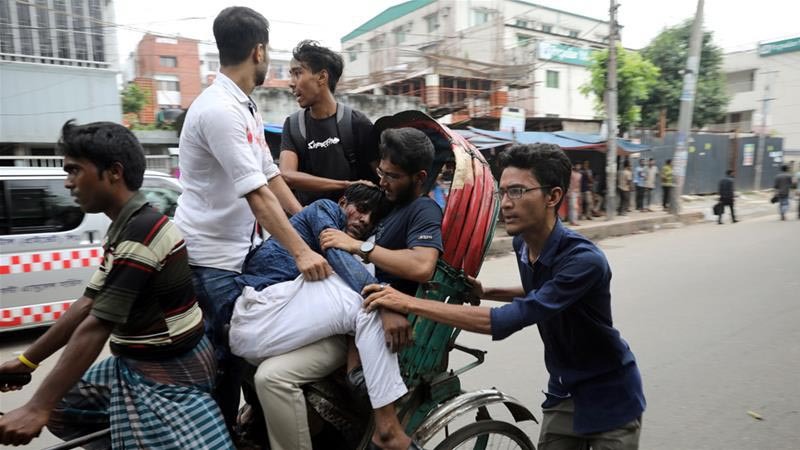 [post_ads]"It was a peaceful rally but suddenly police fired tear gas shells aimed at us [that] left several injured," Mohammad Atikur Rahman, one of the protesters, told dpa news agency. Telecommunications companies were ordered to suspend 3G and 4G services for a period of 24 hours on late Saturday, the English-language Dhaka Tribune reported, hours after dozens of demonstrators were injured during street battles with police on Saturday. Jahirul Haq, chairman of the Bangladesh Telecommunications Regulatory Commission, told AFP news agency regulators received an order from the government, but didn't give further details. [post_ads]The restrictions were rolled out after thousands of students took to the streets in recent days to protest poor road safety following the killing of teenagers Diya Khanam Mim and Abdul Karim Rajib by a speeding bus a week ago. "I request all guardians and parents to keep their children at home. Whatever they have done is enough," said Hasina. "Our police force has started a week-long drive to bring discipline on the roads." Shahidul Alam, a social activist, told Al Jazeera from Dhaka the protests were driven by "larger" factors than road safety alone. Al Jazeera's Tanvir Chowdhury, reporting from Dhaka, said what started as a social movement against traffic safety was now "taking more and more of a political dimension".